The Magician's Apprentice by Trudi Canavan, is the prequel book to the 'Black Magician Trilogy'. In the remote village of Mandryn, Tessia serves as assistant to her father, the village Healer – much to the frustration of her mother, who would rather she found a husband. Despite knowing that women aren’t readily accepted by the Guild of Healers, Tessia is determined to follow in her father’s footsteps. But her life is about to take a very unexpected turn. 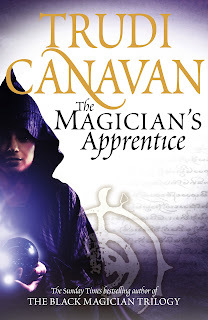 When treating a patient at the residence of the local magician, Lord Dakon, Tessia is forced to fight off the advances of a visiting Sachakan mage – and instinctively uses magic. She now finds herself facing an entirely different future as Lord Dakon’s apprentice. Although there are long hours of study and self-discipline, Tessia’s new life also offers more opportunities than she had ever hoped for, and an exciting new world opens up to her. There are fine clothes and servants – and, she is delighted to learn – regular trips to the great city of Imardin. But along with the excitement and privilege, Tessia is about to discover that her magical gifts bring with them a great deal of responsibility. Events are brewing that will lead nations into war, rival magicians into conflict, and spark an act of sorcery so brutal that its effects will be felt for centuries. This has been the first book I've read from Trudi Canavan. I wanted to start on the series for a while, but it never happened, as I had other books higher on priority, and then I received the prequel from Annelie for my birthday. I think I'm glad that I got to read the prequel first, before the actual serie. I always feel a little weird when I read a prequel after reading the original serie. I know that most books are written in that order, but it was nice for a change to actually start on the prequel. I had some trouble in the beginning of the book to get into the story. Trudi's way of writing is excellent, but I was not really used anymore to real fantasy, in a world that is totally unknown and with terms that are totally different from our own world we live in. Though, when the first "action" kicked in, about two chapters in, I was sucked into the book and didn't really want to put it away anymore. Quite some events happen in the book, sometimes described from different point of views, and a lot of different people and places are introduced, that probably all have their significance to the other books that follow. I really enjoyed the story and I would probably give it 4 out of 5 stars, mostly because that climax you are waiting for in a book never came. I know it is a prequel, but for me there never was that highlight where everything chances. Yes, there were significantly important things that happened, but that climax was never there. Nevertheless, I liked the story, the writing is fenomenal and I will definately give the other books a go as well. as I will always keep telling everybody, those books are an must read and if you dont buy them I will just gift them to you muwhahaha. but yaay that you liked/loved it :D it is an good book, mostly an history book to the other series, but it is important to have read at some point during the series. I hope that one day soon you will read the others to. Thank you for joining us at NOBH. I look forward to reading some of your book reviews.